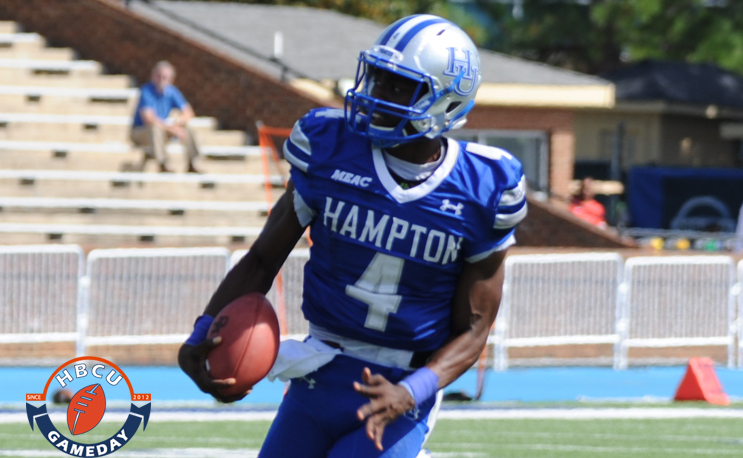 HAMPTON, Va. – Shai McKenzie ran for a season-high 147 yards and the defense made one big stand late in the game as Hampton defeated Florida A&M 34-31 for Homecoming at Armstrong Stadium on Saturday. Hampton’s win puts in a tie with North Carolina A&T for first place in the Mid-Eastern Athletic Conference (MEAC). It was the third straight homecoming win for Hampton and sixth in its last seven as they improved to 5-2 overall and remain a perfect 4-0 in conference play. The Pirates jumped out to a 21-3 lead in the second quarter, which included two touchdown passes by Delmon Williams. Rattler quarterback Ryan Stanley connected with Kareem Smith for a 16-yard touchdown pass to cut the lead to 21-10 at halftime. FAMU cut the margin to 21-17 with the only points in the third quarter taking advantage of a bad punt snap for possession on the Hampton 20. Stanley found Chad Hunter on a six-yard scoring pass to get closer with 10:28 left in the third. In the fourth quarter, the teams went wild as FAMU finished a seven-play, 43-yard drive on the opening play of the quarter with a 35-yard field goal from Khalil Clark to cut the lead to 21-20. Hampton retaliated on a 10-play, 70-yard drive with a 24-yard field goal from Adam Brown to push the lead back to four points at 24-20 with 8:54 left. Now the touchdowns started as FAMU took its first lead of the game on the strength of a 91-yard completion from Stanley to Hunter to lead 27-24 with 7:23 remaining. Hunter caught the ball in stride and carried three defenders into the end zone to give the Rattlers their first lead. Hampton took advantage of a short kick and a celebration penalty on the touchdown, which made FAMU kick from its 20 to start a drive on the Rattler 47. McKenzie had two carries on the drive, the last one being for 37 yards to set Hampton up at the FAMU 8-yard line. On the next play, Williams found Quinton Lee on a short pass and Lee bulled his way in for the score and a 31-27 lead. Once again, Hampton had to rely on its defense for one stop. As FAMU drove down to the Hampton 16-yardline with 38 seconds left, a fourth down and three run by Devin Bowers was snuffed out one-yard shy by Bruce Perry and a host of Pirates to ice the win. Williams ran for 68 yards and threw for 140 going 11-of-16 with three touchdowns. Yahkee Johnson added 62 yards on 14 carries as Hampton ran for 265 yards as a team. On defense, Oral Varcciann had nine tackles and Steven Smith Jr. added eight. Hampton now goes to Daytona Beach, Florida to face Bethune-Cookman University at 4 pm on October 28.